SAP standard supports create/change/display/delete of attachments on VA02 and VA03 (change and display sales order respectively) transactions with the help of value ‘X’ on parameter ‘SD_SWU_ACTIVE’. 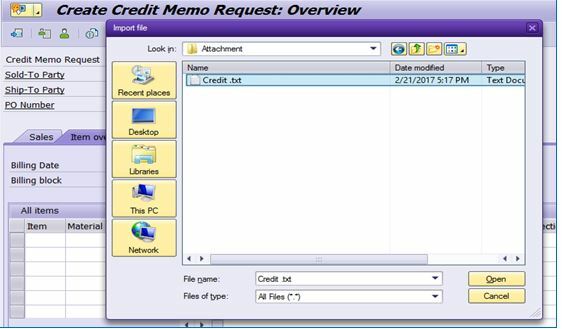 There is no provision to attach/view attachment while credit memo requests are being created. Objective of this RICEF is to enable this attachment functionality for ‘create’ transactions also. For the Sales Order Creation screen (VA01), the GOS tool bar is not provided by standard SAP. 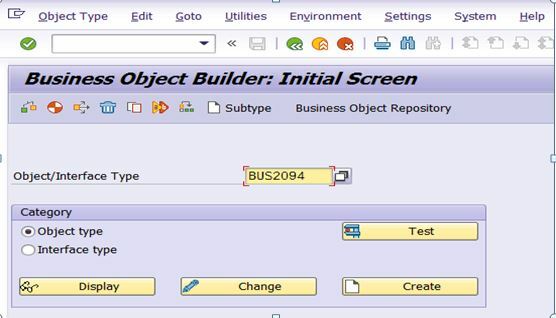 To resolve the above issue, we can use a SAP provided toolbar “Generic Object services” or “GOS toolbar”. Following is the step by step instruction to use GOS Toolbar for resolving attachment issue. 2.1 Step 1: To activate it we need to do an enhancement in include ‘SAPMV45A’ inside form SP_TAGGING. 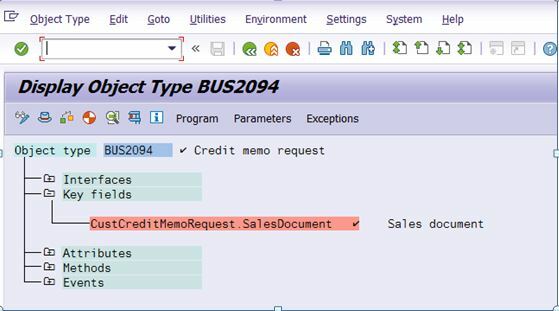 P.S: For above three Object types, object key is same and that is Sales Document. IF sy-tcode = ‘VA01’ AND lv_flag <> ‘X’. IF NOT ls_borident-objtype IS INITIAL. CONCATENATE ‘ZGOSVA01’ sy-uname sy-datum sy-uzeit INTO ls_borident-objkey. EXPORT ls_borident-objkey TO MEMORY ID ‘ZGOSVA01’ . 2.5 Step 5: We have to attach that document to newly created sales order. So code needs to be added in user exit MV45AFZZ inside form USEREXIT_SAVE_DOCUMENT. IF NOT ls_source-typeid IS INITIAL. IMPORT ls_borident-objkey FROM MEMORY ID ‘ZGOSVA01’ . 3.2 Step 2: Click on the GOS toolbar. Different options will be displayed. 3.3 Step 3: Click on ‘Create-> Create attachment’ option. 3.4 Step 4: A pop-up window will be opened to find a file or attachment as shown below. Select the file and click on open. 3.5 Step 5: A success message will be displayed in the task bar. 3.6 Step 6: If we open sales order in display/change mode, you can see the document in Service: Attachment list tab. 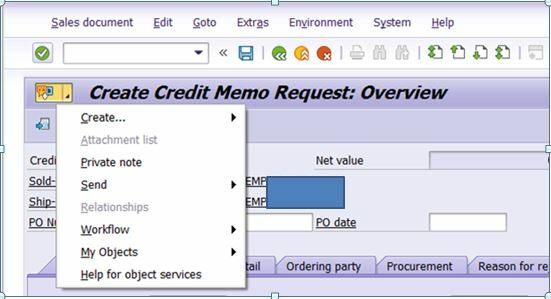 This document would be useful for different groups of business users while creation of new credit-memo or debit memo request (Sales Order) in SAP system. In the above way, using ‘Generic Object services toolbar’ or ‘GOS toolbar’ different files can be attached. I had the same problem and found only the note 1466810, which states that it is (in standard) not possible. It appears, that now this is now available via 2413663 – File attachments in sales documents creation. we implemented note 2413663. So the GOS are now visible in VA01 and I am able to add a attachment. But unfortunately I cannot add a “Business Document” in VA01. I have only the Options “Create attachment” and “Create note”. Has somebody solved that? Any suggestion, what can we do on the 604?